There has been quite some debate about the benefits of organic versus conventional foods. But what has science actually been showing? Is it worth it or not to buy organic foods? So, first let’s define what “organic” means. There are several types of organic labelling, but in general, for a given crop to be qualified as “organic”, it is not allowed to be sprayed with any synthetic chemicals and certain mineral fertilizers, and it also avoids hormones, antibiotic agents, genetic engineering, and irradiation . They use instead organic fertilizers (such as manure and composts), use legume crops in rotation (to increase soil nitrogen levels) and apply non-chemical crop protection methods (e.g., crop rotation, more resistant varieties, mechanical weeding and biological disease and pest control products). For organic livestock, the routine use of antibiotics or growth hormones is not allowed and the animals should have access to the outdoors . A study published in 2012 reviewed 55 studies and found no significant difference in nutrient quality between organic and conventional products . Another study published in the same year also concluded that organic foods were not more nutritious than conventional ones . 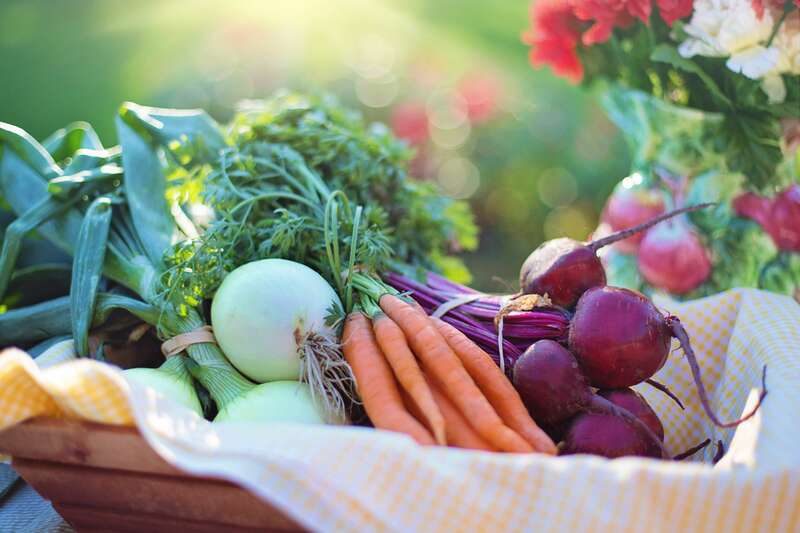 However, very interestingly, they found that consumption of organic foods may reduce exposure to antibiotic-resistant bacteria and pesticide residues (more on that below). Also, other researchers found that contamination of plants with the bacteria Salmonella enterica is much more likely in conventionally grown crops than in organic ones . Then, a major study was published in 2014 in the British Journal of Nutrition. The researchers looked at 343 peer-reviewed scientific publications that studied organic versus non-organic foods. They found that several types of antioxidants, such as polyphenols, were substantially higher in organic than in conventional foods . For some types of antioxidants, the content in organic foods was almost 70% higher than in conventional ones! Free radicals are being constantly formed in our body and when in excess, they can lead to inflammatory processes and chronic diseases. Antioxidants can neutralize free radicals and therefore their presence in our body is essential. Indeed, a higher intake of antioxidants from foods (not supplements!) has been linked to a reduced risk of many diseases, such as cardiovascular diseases, neurodegenerative diseases and cancer [6, 7]. So, the fact that organic foods have much higher antioxidant content than conventional ones is, in my opinion, a major reason to choose organic foods, even if the other nutritional content of both food types is comparable. The same study also analyzed the difference in pesticide residues in organic and conventional foods. They found that the occurrence of pesticide residues was 4 times higher (!!!) in conventional crops and these also contained higher concentrations of the toxic heavy metal cadmium . Pesticides have been classified as probable carcinogens for many years. It is well known that people living in areas with high pesticide use (or farmers, of course) have an increased risk of all cancer types  as well as other diseases such as Parkinson, Alzheimer, amyotrophic lateral sclerosis (ALS), birth defects, reproductive disorders, diabetes, cardiovascular diseases, autoimmune diseases, respiratory problems like asthma, etc . This is because pesticides introduce genetic damages, epigenetic modifications, endocrine disruption, mitochondrial dysfunction, oxidative stress, among others . However, I should mention that this long-term exposure to pesticides because of living close to conventional agricultural fields is different from consuming vegetables and fruits with pesticides. It still seems that the benefits of consuming more fruits and vegetables per day, organic or non-organic, are higher than the risks of not consuming enough vegetables and fruits in terms of cancer risk . The consumption of organic foods seems to be particularly important in pregnancy and in childhood. For example, a study considering 28,192 women found that organic vegetable consumption was associated with a reduced risk of pre-eclampsia (high blood pressure and protein in the urine during pregnancy) . The authors suggest this could be due to a lower pesticide exposure and higher antioxidant content in the diet as well as a different composition of the gut microbiota. Also, in children who have a higher urine concentration of pesticides from the class of organophosphates have twice the odds of being diagnosed with attention-deficit hyperactivity disorder (ADHD) compared with children with undetectable levels of these pesticides . In fact, several studies have shown that prenatal and childhood exposure to these type of pesticides is neurotoxic (meaning toxic for the brain), inducing behavioral and cognitive deficits in infants and children [13, 14]. Studies also found an association between prenatal maternal occupational pesticide exposure and childhood leukemia . However, there is good news! An organic diet can significantly lower children’s exposure to pesticides  (at least in the ones that don’t live close to conventionally sprayed fields). In another study, it was shown that only 5 days of an organic diet seems to be enough to reduce pesticide urine concentration to almost non-detectable levels in children living in urban environments  (although these have other pollution problems, as you might imagine). In adults, it was also shown that only 1 week of eating an organic diet reduced pesticide exposure . So, is it worth it to buy organic foods? If you want to increase your antioxidant while minimizing your pesticide and heavy metals intake, contribute to a cleaner environment and to healthier future generations, then yes, it is totally worth it!! Also, don’t forget that everything you buy is a vote! Organic foods are more expensive than conventional ones? Yes, they still are, but remember that conventional foods come with a very high price, which you don’t see directly when you buy a product. This high price includes the pollution of our environment, including our soil and water supplies (because the pesticides end up inevitably in the water), higher rates of chronic diseases which in turn affect our Health System costs, etc. So my tip: whenever possible, buy organic vegetables, fruits, nuts, legumes, wholegrains, etc and avoid buying products like cookies, chips, cakes, etc… You will see that if you buy more “real food” and not so much of the processed stuff, you will end up spending almost the same. And, if on top of that you reduce your intake of animal products, like meat and processed meat (e.g. ham) intake, and for that you start eating more legumes (beans, chickpeas, lentils, peas), you will even save some money. Meat and other foods from animal origin are more expensive than plant foods anyway and the truth is that the majority of us eat too much of them nowadays. It is quite common for people to eat these foods 3 times a day, which is a big problem in terms of health and sustainability (but I will leave this topic for a future blog article). So if you do choose to eat animal products, try to buy always organic, eat less of them and opt to eat more legumes instead. I would like to add, however, that buying organic fruits and vegetables that come from far away is not, in my opinion, a good idea due to sustainability reasons. So, if possible, try to buy organic local products – and if very local is not possible, then buy products that come from your country or neighbour countries. Now a small but very important note: not all organic foods are healthy! And why not? – if they come in a package – check always the ingredient list, no matter if it is an organic product or not! – Organic foods have a much higher antioxidant content than conventionally grown foods. – Organic foods have much lower amounts of toxic pesticides and heavy metals, such as cadmium, than conventionally grown foods. – Consumption of organic foods may reduce exposure to antibiotic-resistant bacteria. – Pesticides are polluting our environment and contributing to the increase in chronic diseases in people chronically exposed to them. – Organic farming is much more sustainable than conventional farming. – A food labelled organic does not necessarily mean it is healthy. A vegetable or fruit or any other “real” food coming from Nature (and that in general does not need a package) labeled as organic is healthy. Junk foods coming in packages and labeled organic (such as organic sugar; organic candies, chocolates, chips, etc) are not healthy! Forman, J., et al., Organic foods: health and environmental advantages and disadvantages. Pediatrics, 2012. 130(5): p. e1406-15. Dangour, A.D., et al., Nutritional quality of organic foods: a systematic review. Am J Clin Nutr, 2009. 90(3): p. 680-5. Smith-Spangler, C., et al., Are organic foods safer or healthier than conventional alternatives? : a systematic review. Ann Intern Med, 2012. 157(5): p. 348-66. Gu, G., et al., Organically managed soils reduce internal colonization of tomato plants by Salmonella enterica serovar Typhimurium. Phytopathology, 2013. 103(4): p. 381-8. Baranski, M., et al., Higher antioxidant and lower cadmium concentrations and lower incidence of pesticide residues in organically grown crops: a systematic literature review and meta-analyses. Br J Nutr, 2014. 112(5): p. 794-811. Del Rio, D., et al., Dietary (poly)phenolics in human health: structures, bioavailability, and evidence of protective effects against chronic diseases. Antioxid Redox Signal, 2013. 18(14): p. 1818-92. Wahlqvist, M.L., Antioxidant relevance to human health. Asia Pac J Clin Nutr, 2013. 22(2): p. 171-6. Parron, T., et al., Environmental exposure to pesticides and cancer risk in multiple human organ systems. Toxicol Lett, 2014. 230(2): p. 157-65. Mostafalou, S. and M. Abdollahi, Pesticides and human chronic diseases: evidences, mechanisms, and perspectives. Toxicol Appl Pharmacol, 2013. 268(2): p. 157-77. Reiss, R., et al., Estimation of cancer risks and benefits associated with a potential increased consumption of fruits and vegetables. Food Chem Toxicol, 2012. 50(12): p. 4421-7. Torjusen, H., et al., Reduced risk of pre-eclampsia with organic vegetable consumption: results from the prospective Norwegian Mother and Child Cohort Study. BMJ Open, 2014. 4(9): p. e006143. Bouchard, M.F., et al., Attention-deficit/hyperactivity disorder and urinary metabolites of organophosphate pesticides. Pediatrics, 2010. 125(6): p. e1270-7. Munoz-Quezada, M.T., et al., Neurodevelopmental effects in children associated with exposure to organophosphate pesticides: a systematic review. Neurotoxicology, 2013. 39: p. 158-68. Jurewicz, J., K. Polanska, and W. Hanke, Chemical exposure early in life and the neurodevelopment of children–an overview of current epidemiological evidence. Ann Agric Environ Med, 2013. 20(3): p. 465-86. Wigle, D.T., M.C. Turner, and D. Krewski, A systematic review and meta-analysis of childhood leukemia and parental occupational pesticide exposure. Environ Health Perspect, 2009. 117(10): p. 1505-13. Lu, C., et al., Organic diets significantly lower children’s dietary exposure to organophosphorus pesticides. Environ Health Perspect, 2006. 114(2): p. 260-3. Lu, C., et al., Dietary intake and its contribution to longitudinal organophosphorus pesticide exposure in urban/suburban children. Environ Health Perspect, 2008. 116(4): p. 537-42. Oates, L., et al., Reduction in urinary organophosphate pesticide metabolites in adults after a week-long organic diet. Environ Res, 2014. 132: p. 105-11. Oquist, K.A., J.S. Strock, and D.J. Mulla, Influence of alternative and conventional farming practices on subsurface drainage and water quality. J Environ Qual, 2007. 36(4): p. 1194-204. Badgley, C., et al., Organic agriculture and the global food supply. Renewable Agriculture and Food Systems, 2007. 2(2): p. 86-108. Hi Ana, thanks for another great article ! I’ve been eating 100% organic plant based for years now and although I had to come out of retirement to afford it, I feel it is SO WORTH IT ! I am extremely healthy and fit, and feel decades younger. It is a time consuming commitment though, having to shop at multiple stores each week, looking for the freshest organic produce, cleaning it, and properly storing it. A great book for learning all about preserving the nutrients in fresh produce is “Eating on the Wild Side’ by Jo Robinson. I just planted my organic garden …the soil is from compost and old horse manure, and it looks like it is going to thrive ! It will be wonderful to just go outside and pick fresh whatever I want ! Think how nutrient dense it will be just minutes after picking ! I can’t wait !!! Hi Jennifer! Thank you! 🙂 And thank you for sharing your experience with fresh organic food! I also think it is totally worth it. About the time we need for food preparation – indeed, eating healthy does take time and a few tricks to optimize the time in the kitchen :). And I totally agree that the best food is the one coming straight from our garden! 🙂 Thanks for the book, I didn’t know it but will take a look – the title sounds very interesting! Awesome article I definitely learned something new, about 2/3 of it I was already aware of from reading a lot but I was not aware that organic had 70% more antioxidants, I was not aware that the toxic residue was 4 times higher or that conventional farming was linked to so many diseases! Thank you for the post look forward to reading more!